Being a newbie needs mentorship and support group, hope you guys will be there for me. :) Will absolutely return your a huge favor. Thanks to the Mommy Rubz and the rest of Pinay Mommy Online for this opportunity for all the Filipino bloggers out there. Hi sis, i followed you already either via username Green Dei or Blodwyn. :) Will check you other sites too! Thanks for following. Hi momgen, thanks will return the favor. I am follower #8 from WBFC! Happy Home Working with ACmomCee Btw, I have an ON-GOING giveaway... Hope you can join. Thanks! 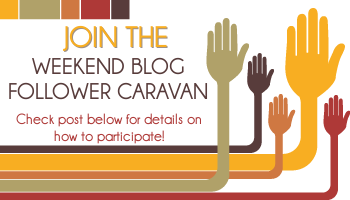 Following via Weekend Blog Follower Caravan!